Carpets need to be cleaned professionally at least once every six months to keep their original colours and be used long time. 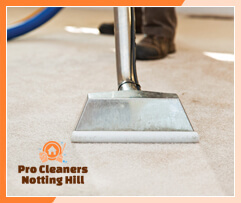 Pro Cleaners Notting Hill offer deep cleaning and refreshing of carpets done with the help of modern and effective cleaning machines. Our cleaning staff will check the condition and fabric of your carpets and apply the most suitable cleaning procedures on it. They are qualified, skilled and use the most effective machines for sanitising different carpet fabrics. 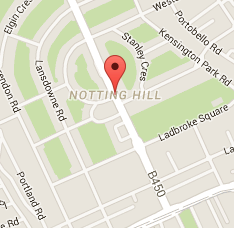 Our carpet cleaning services are available in W11 Notting Hill and the neighbouring areas. Our staff will completely remove the blemishes, dirty marks and odours from smoke and pets. They will vacuum clean the carpet to gather the visible dirt and grime. If there are darker areas, smudges or spills on the carpet, our cleaning technicians will spray and pre-treat them. Then, they will either dry or steam clean the carpet. Dry cleaning is done with the help of powder which is rubbed deep in the fabric of the carpet. Special machines vacuum the dirt and soiling from it. Our carpet cleaning services are done according to the fabric and condition of every carpet. You carpets will be used many years and retain their real colours if you sanitise them properly and regularly. 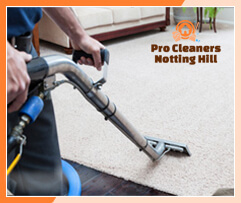 Our carpet cleaning services are at your disposal in Notting Hill London at affordable prices seven days in the week.